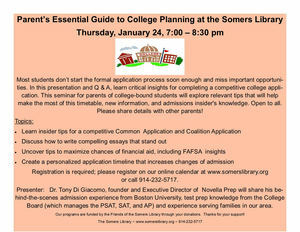 On Thursday, January 24, 2019 from 7:00p.m until 8:30 pm., The Somers Library will be holding a Parents Essentials Guide to College Planning. Most students don't start the formal application process soon enough and therefore may miss important opportunities. In this presentation and Q & A, learn critical insights for completing a competitive college application. This seminar for parents of college-bound students will explore relevant tips that will help make the most of this timetable, new information, and admissions insider's knowledge. The workshop is open to all. Please share these details with other parents! Topics: . Learn insider tips for a competitive Common Application and Coalition Application . Discuss how to write compelling essays that stand out • Uncover tips to maximize chances of financial aid, including FAFSA insights . Create a personalized application timeline that increases changes of admission Registration is required; please register on our online calendar at www.somerslibrary.org or call 914-232-5717.